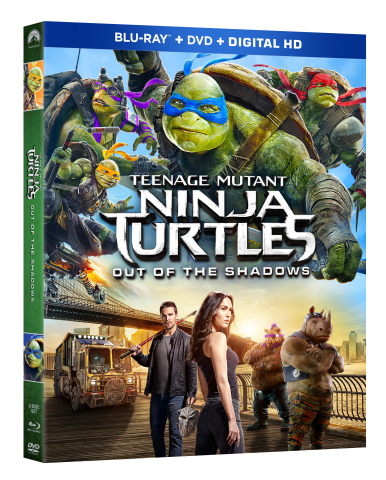 The Turtles Rule Again in the Best Family Action Movie of the Year, TEENAGE MUTANT NINJA TURTLES: OUT OF THE SHADOWS, Arriving on Blu-ray™ Combo Pack and DVD September 20, 2016 with Two Reversible Turtle Masks in All Four Colors! weeks early on Digital HD September 6. Perry in the live action film that is fun for the whole family. Digital HD copies of both movies, and the two reversible masks. Audio Description and English, French, Spanish and Portuguese subtitles. securely—to a variety of devices. Shadows.” Music by Steve Jablonsky. Executive producers Denis L.
Eastman. Written by Josh Appelbaum & André Nemec. Directed by Dave Green.